In too many organization, nobody – except perhaps the CEO – is really quite sure what the strategic vision of the company is and how it relates practically to the work they do on a daily basis. Does it matter? 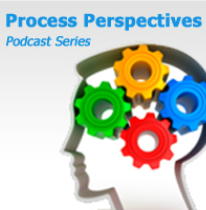 More than you might think, says the guest on this Process Perspectives podcast. This entry was posted on Friday, April 26th, 2013 at 06:17 pm and is filed under Uncategorized. You can follow any responses to this entry through the RSS 2.0 feed. You can leave a response, or trackback from your own site.